Caring Pharmacy Group Bhd is an investment holding company, which engages in the operation of community pharmacy including retailing of pharmaceutical, healthcare, and personal care products. The company’s product offerings include scheduled drugs, over-the-counter drugs, health supplements, personal care products, healthcare devices, health food, confectionery, beverages, and household products. The firm principally operates in Malaysia. singh1 You can check any stock on this website. For free float check summary. copy paste the following. 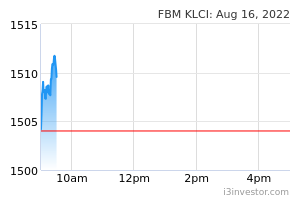 We have screened on CARING PHARMACY GROUP BERHAD on 28 Aug that it has a potential up side and it has gone more than 20% up as of 4 Sep closing. You may get the daily stock screening after 9:00PM for potential upside stocks for the next trading day. It's free and you may sign up at. iPong5 Bought at RM1.00. Contemplating to sell. singh1 Until now no news to explain the upward trend. Not easy to decide to hold or sell. I have decided not to sell and will keep as this counter has a lot of potential. leehualoon The Board of Directors of CARING wishes to announce that the Company proposes to seek the shareholders' approval for the proposed authority for the Company to purchase its own shares (“Proposed Share Buy-Back Authority”) at the forthcoming annual general meeting. 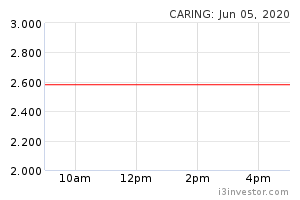 A Statement to Shareholders containing the details of the Proposed Share Buy-Back Authority will be dispatched to the shareholders of CARING in due course. singh1 Why privatize in just two years after listing? Took some profit on friday. Got this lousy feeling about the red shirt rally coming up. I think they are up to no good. They want to send a message to yellow shirts that in future u guys come out expect lots of trouble from us. I am only guessing but if that is the plan, it could affect the stock market and currency and a lot more. unlimited_risk anyone have idea about this counter? malinfan run...run...run... no hope liao...! malinfan wishing everybody here A HAPPY CHINESE NEW YEAR and " 恭喜发财 " . singh1 People already goreng and left. bonescythe buy in and wait..
Noni At current price, is tough call. mfmqqq recommended trading buy for caring..tp3.11...buy, accumulate and hold till year end...buy..good luck.. Bonus, share split, special dividend? shpg22 Hefty valuation at this price. monkeyinvestor buy with 40% profit! monkeyinvestor another good buy stocks SEM is a must buy ! Flintstones Mind to share more? Korean plan? sleang Better QoQ results, but price dropped from 2.x to 1.85? Something wrong? thek Very quiet here, what happen to the plan? veron4best corporate tax lower? or what? why latest Q PBT is lower than NP? UnicornP Prospect is good but very the illiquid.